This Tripp Lite surge suppressor is designed to provide safe, reliable surge protection in harsh environments. A high 3900 joule rating can protect connected equipment against even the strongest surges. 8 outlets protect connected equipment against damaging surges, spikes and line noise. Convenient transformer outlets accommodate multiple transformers without blocking other outlets. A 7.62 m (25-ft.) grounded cord with integrated cord clip reaches distant outlets. A lighted on/off switch with integrated circuit breaker provides power control over connected equipment. Breaker protects against dangerous system overload. Protected LED confirms that connected equipment is being protected. 4 safety covers shield unused outlets from debris and accidental contact. A rugged metal case stands up to the harshest environments. Built-in cord wrap with hang holes provides convenient cord management. Integrated keyhole slots on bottom panel provide convenient wall/desk mounting. Tripp Lite will repair or replace any connected equipment damaged by surges, including direct lightning strikes, up to $100,000 and for life! 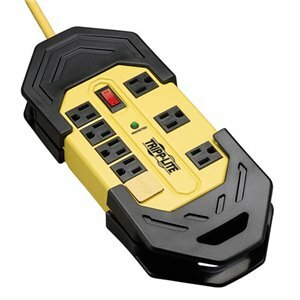 As an added safety feature, the surge suppressor's bright yellow color alerts you and others that power cords and tools are in use. Mobile power distribution and surge protection just became a lot easier. With Tripp Lite's Protect It!® TLM825SA Surge Protector, you'll have reliable, protected outlets where you need them, even in the harshest of worksite environments. The TLM825SA provides eight standards outlets with 3900 joules of surge protection in a yellow, all-metal housing that ensures workplace safety and is guaranteed to last for life. TLM825SA is ideal for industrial, automotive or worksite applications and can be mounted in a variety of ways with its integrated keyhole mounting slots. With the extra length provided by the 25-ft. power cord, you don't have to install the TLM825SA next to outlets you already have; it can be mounted across a large area and deliver reliable service where you need it most. The unit also comes with four outlet safety covers to shield unused outlets from debris and accidental contact. A lighted On/Off switch provides convenient power control, while a 15-amp circuit breaker guards against dangerous circuit overloads before they happen. Additionally, the TLM825SA comes with a lifetime product warranty and $100,000 Ultimate Lifetime Insurance for guaranteed peace of mind. With keyhole mounting installation, high surge suppression rating, a rugged housing and plenty of outlets, Tripp Lite's TLM825SA is ideal for industrial, automotive and other applications with harsh environments. An extra-long cord and bright yellow color make it a great solution for mobile worksite applications. It provides reliable, consistent power service for multiple devices. The keyhole mounting slots allow the TLM825SA to be installed wherever reliable, multi-outlet power distribution is required. Featuring eight standard outlets and a 3900-joule suppression rating, the TLM825SA is an ideal solution for applications or locations that require power to many devices simultaneously. The housing features three outlets specifically spaced to accommodate bulky transformers. When not in use, outlets can be protected from debris and accidental contact with the included outlet safety covers. Install the TLM825SA far away from its power source and provide power distribution to previously un-powered areas with the extra long, 25-ft. power cord. The TLM825SA can be mounted in a different area, or a completely different room, from where it draws AC power, putting you in control of getting reliable power service where you need it most. The lighted On/Off switch provides convenient power control and allows you to see whether the TLM825SA is operational with a glance. Four included outlet safety covers keep debris and moisture away from unused outlets making the TLM825SA safe and reliable to use in even the harshest of worksite environments. A built-in, 15-amp circuit breaker prevents dangerous circuit overloads that could damage equipment. The breaker immediately shuts off AC input to the TLM825SA when it detects that the equipment load is drawing too much power. The TLM825SA's rugged, all-metal housing is durably constructed making it a great solution for industrial, automotive and mobile worksite applications. It also features a bright yellow color that complies with OSHA color guidelines to alert users to hazardous situations, which may cause minor or moderate injury. A built-in cord wrap with hang holes is included for convenient storage. Get peace of mind with Tripp Lite's lifetime product warranty, which protects your product against any technical defects or malfunctions for as long as you use it, and $100,000 Ultimate Lifetime Insurance for connected equipment. The TLM825SA also comes with a green, RoHS-compliant design.